Rising proudly from the city center in Monument Circle is the Indianapolis Soldiers and Sailors Monument, the largest monument in the United States to be dedicated to the common soldier. If you're visiting Indianapolis for the first time, or if you just need a reminder of our city's great heritage, the Indianapolis Soldiers' and Sailors' Monument is a must-see! At 284.5 feet tall, the Soldiers and Sailors Monument is a mere 15 feet shorter than the Statue of Liberty. The monument took 12 years to complete and is crafted from Indiana limestone. Victory, the bronze figure at the top of the monument, faces south to welcome home soldiers returning from battle. The four statues at the corners of the monument represent the Infantry, Cavalry, Artillery and Navy. A box hidden in the cornerstone of the monument contains a list of Indiana soldiers who fought for the Union during the Civil War, a Civil-war battle flag, and a photograph of the monument’s designer Bruno Schmitz. The Colonel Eli Lilly Civil War Museum is located in the lower level of the monument. It features photographs, documents, letters and artifacts from the approximately 200,000 Hoosier soldiers who fought during the Civil War. 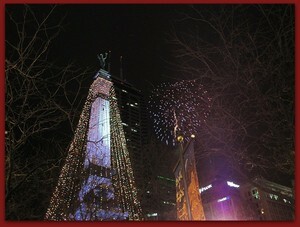 Beginning the day after Thanksgiving, the Indianapolis Soldiers and Sailors Monument in the city’s Circle Center transforms into a giant Christmas tree strung with nearly 5,000 lights and innumerable strands of garland. The evening’s festivities included performances by local talents, and culminate with a visit from Santa, the official tree lighting, and fireworks! Did you know... that Indianapolis is second only to Washington, D.C. in the number of war memorials found throughout the city?